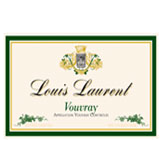 Luneau USA is the premier importer of international wines in the United States. 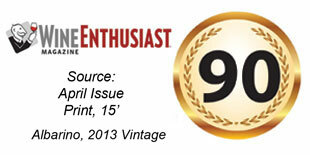 We select the best wines from California, France, Portugal, Italy, and Spain. 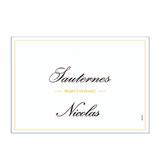 Luneau's portfolio features Ed Hardy Wines, and Nicolas from France. Luneau USA is commited to importing wines from vineyards that are good stewards to the environment. Luneau has partnerships with vineyards that are eco-friendly, respect for the land and natural resources. Like Us. 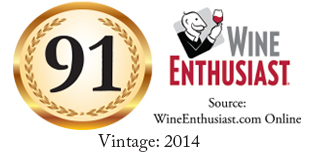 Be informed about new ratings and wine tastings with the Luneau USA Facebook page. 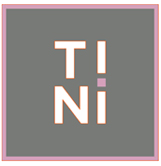 Pin Our Wines. 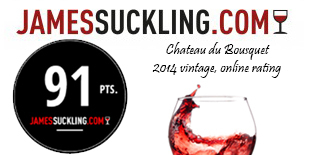 Pin our rating tech sheets to your favorite wine boards. Nice pale color with strong pink highlights. This delicious red wine is made from the Montepulciano grapes, inky blackish purple in color, with rich aroma of black plums. Nicely balanced, with food friendly, soft tannins and a smooth finish. From the rolling hills of the Abruzzi Region, this wine is clean and zesty, a nice cocktail sipper, with flavors of green apples and pears. Excellent as an aperitif, idea companion to appetizers, hors d'oeuvres and seafood dishes. This light and harmonious wine combines perfectly with all types of food, especially meat, rice dishes and pates. It has been bottled under the strictest hygienic conditions to maintain its qualities of colour, aroma and flavour. This wine has been made using traditional methods and the utmost care has been taken when its vinification, preservation and bottling. The crimson colour ensures all of the characteristics desired in red wine. 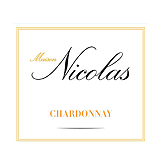 Pale lemon yellow in color with clean, fresh and fruity aromas on the nose. Dry and soft on the palate, with good balanced acidity. Ideal with light dishes, such as soup, fish, and seafood. After pressing, the juice of the Airen grapes is carefully selected for its aromas. Raspberry color. 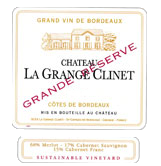 Fruity scent in the mouth, mellow, very supple and rich, red fruit first flavor. 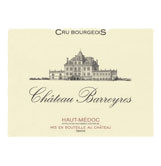 Chateau Barreyres 2014 shows a sumptuous deep purple color. Open on the nose with appealing scents of fresh fruit alongside classic features associated with well-managed aging. This is a fine, elegant Cru Bourgeois with a very pleasing profile, including good structure and a full body. The finish is remarkbly persistent. This wine is appreciated with a piece of beef or a leg of lamb. Ideal with grilled veal or beef tenderloin at a temperature of 15 c.
Appealing notes of black fruit and mocha on the nose. A powerful palate with elegant tannins, brightened by notes of eucalyptus adding freshness and complexity. 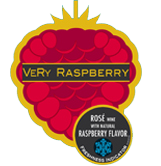 Pleasant fruity nose (blackcurrant, raspberry). The mouth is supple and ample, concentrated where the fruit is generous with a soft attack. Pale yellow with straw reflections. Expressive nose with notes of citrus and broom flowers. 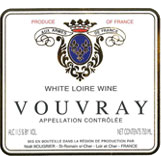 The mouth has a beautiful volume with a wide range of aromas of ripe white fruit. This wine will surprise you by its complexity and finesse. 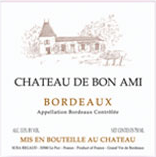 Castle Bon Ami comes from a selection of terroirs majority Sauvignon and Semillon, combined with wine-based fruit and instant pleasure. This wine comes from fields located in the North East of our field. Dense and full of character on the palate with perfect balance. Nicely crafted tannins lead to a good, persistent finish. Smooth, developing a full body with powerful tannins. Good length on the finish, making this an indulgent, moreish wine. The vintage shows an appealing pale gold color. 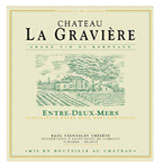 This is an outstanding Graves wine with an exceptionally fresh and fruity profile. Elegant citrus on the nose highlighting a vein of minerality, a feature of the Semillon and Sauvignon Gris grapes. 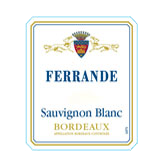 The hint of ginger, one of the hallmarks of Chateau Ferrande, does not disappoint. Dark garnet color with tile-red highlights. 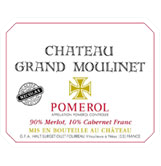 Aromas of black cherries and cinnamon with a hint of smoke and toasted wood. Strong backbone, and a bit rustic and earthy. 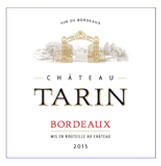 Tannins are present and vigorous. Still quite young. 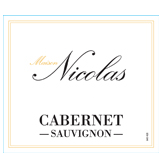 Deep ruby color, fruity with notes of spices, supple and round tannins Slightly oaky, long and aromatic finish. Overall well balanced and savory. 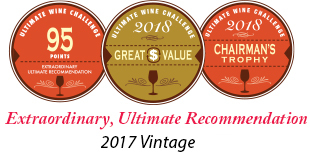 Like their red counterparts, the white wines of Bordeaux and burgundy reflect two ends of stylistic spectrum. 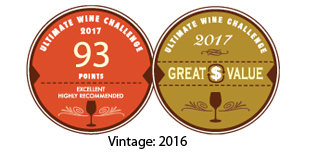 In this case the comparison is between the rich, full Chardonnay of Burgundy and the leaner tauter, Sauvignon Blanc of Bordeaux. Black pepper nose. Spicy, peppery mid-plate finishing with lush dark fruit flavors and mid-weight textured tannins. The village of Saint-Magne-de-Castillon is a small French village located south west of France. 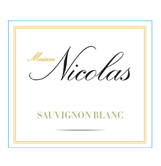 A brilliant clear yellow, with touches of green, - An aroma of peach and citrus fruit, with a hint of mineral, - A delicate initial taste, then lively but with a round smoothness and a long, straight finish, well-balanced structure. Mechanical hoeing of the soil, to avoid use of herbicides. Yield limited by summer pruning in July. Maturity control by manual trimming. Each vineplant is individually tended over ten times each year. Forward red berry fruit, mid-weight tannins, bright finish with lifted acidity. The vineyard lies on an alignment of hills and plateaus that dominate the river Dordogne and the soils are mainly clay and limestone. Dark brooding black cherry fruit enhanced by balanced acidity in the finish. The village of Cazaugitat is located in the Southwest of France in the Entre Deux Mers region, 48 km from the city center of Bordeaux. Known as the Garden of Eden, it is a sleepy town with only 255 inhabitants. 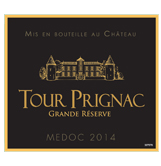 Chateau Tour Prignac shows a beautiful dark ruby red color. Ripe red fruit on the nose with a delicious touch of spice. A smooth, well-structured body with a vein of silky tannins. Admirable elegance gives way to a very pleasing finish - full of promise. Don Ed Hardy is known as The Godfather of the Modern Tattoo for his sophistication, depth, and sense of experimentation. A California native, Don Ed Hardy is recognized around the world for his technical brilliance and mesmerizing imagery. Sight: Straw colour with greenish hints, clean and bright. 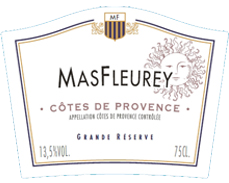 Nose: Expressive clean aroma of fresh fruit, with herbaceous undertones and tropical notes. Palate | Well-balanced on the palate, powerful with a fruity after taste and hints of aniseed. The grape verdejo is perfected in Castilla Leon, but only in la SECA (inside the DO Rueda) we can find the old fine vines and the type of soil to create this outstanding white wine. Light straw color with green highlights. 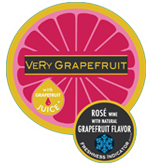 Nice and refreshing nose, with citrus fruits and exotic fruit fragrances. Will accompany salmon, grilled poultry, and light goal cheese. Fine bubbles, given by the second in-bottle fermentation, also called Methode Traditionnelle; as well as a light golden colour and ample bouquet give to this wine a great power of seduction. Excellent value for a bubbly aperitif. Strawberry souffle with sliced strawberries and raspberry chocolate French macaroons. Deep intense red robe.Nose expresses notes of blueberries and purple.Mouth fleshy and round, develops a charming and meaning bouquet. Working in harmony with our wonderful terroir allows us to bring out the full fruitiness in our wines.During the winemaking,we proceed on a cool and long fermentation to express the fruity and the very good structure. 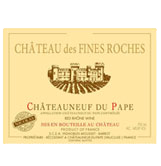 Appealing flavors of well-ripened berries develop on the palate, balancing perfectly with the oaky flavors. 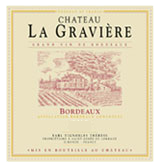 The finish is long and harmonious, indicating a wine with outstanding potential. Mainly oriented to the south, the vineyards enjoy optimum exposure. The nature of the soil is mostly clay-gravel and the configuration of the vineyard slopes and small valleys provide excellent water drainage. Intense and deep ruby red color. The nose reveals aromas of red fruit and spring flowers. The mouth is generous, round, and well concentrated with red fruit. 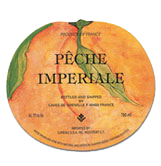 Slightly orange and gold colored, it captures the nuances of dried apricots and hazelnuts. It develops its entire aroma and character and leaves a delightful slight taste of freshness on the palate. Light yellow straw color. Medium bodied, with aromas of fresh apples and pears. Well balanced with good acidity. Crisp and lingering finish. Sight | Beautiful blackberry color with deep red and violet glints. Nose | Red berries (cherries and plums) and mineral notes. Dark chocolate, balsamic and high roast hints. Taste | Fresh, fruity and silky. Round and pleasant in your mouth, thanks to its soft tannins. Very Elegant. Vineyards | 30 years old vines from Finca Cristina (Canada del Trigo). Harvest | Manual harvest in boxes of 15Kg. Aging | 6 months in oak barrels. 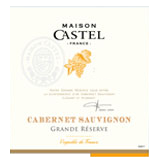 The essence of French varietal, plot selection in specific Terroir in the south of France and a lot of care in winemaking are the success of Maison Castel Grande Reserve. 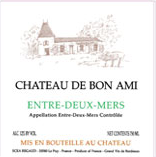 A wine profile on elegance, complexity, finesse and pure expression of the varietal. 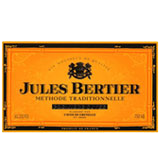 Intense and complex with exotic fruit aromas and subtle toasted overtones. Full-bodied and fresh with delicate aromas of vanilla and a long finish. Intense cherry color with violet highlights show the youth of this wine. In the nose, it shows complex fruity aromas combined with notes of fresh jam. Minerally, and fresh in the mouth, with a sweet fruit bouquet. Fresh aromas of melon, lemons and minerals are delightfully clean on the nose. Ripe juiciness explodes on the palate, quickly followed by refreshing minerality and lingering notes of white flowers, honeysuckle and lemon zest. Delicious. 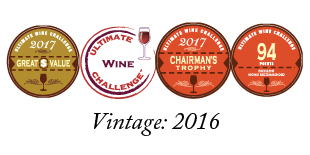 (2018 Ultimate Wine Challenge Panel in reference to 2017 vintage). The feminine curves of this bottle contain a delicately dry delight. The nose is fresh and reveals aromas of cranberry and fennel, nuanced with notes of peach and apricot. 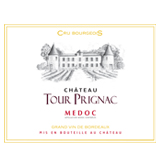 A lovely picnic wine to partner with cold meats, grilled chicken or mild cheeses. This wine expresses the aromas and typical flavors of the Viduaban vineyard. 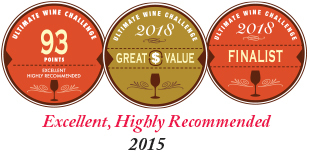 The combination of an ultra-modern winery and traditional wine marking technique ensures perfect quality control and preserves the authentic character. 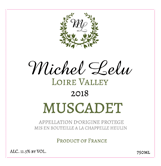 Michel Lelu Muscadet is refreshing wine, and easy to enjoy. 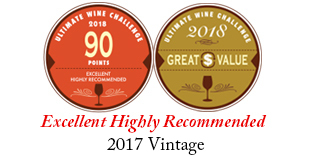 The 2018 vintage shows an attractive pale yellow color with golden nuances, fruity, fine, and elegant with slightly fizzy and aromatic finish. 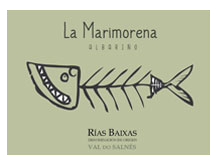 This wine pairs very well with seafood, or sere as an apertif with mature goat cheese. It is excellent with pasta, white meats, and light cheese. Pairs well with seafood, soups, and pizza, as well as an apertif. Color : red hardwood, with violet reflections. 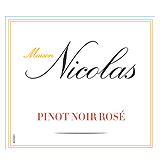 Nose: complex, consisting of small red fruits (cherry, strawberry wood), with hints of pepper finely. Mouth marked by black fruit (blackberry, blackcurrant), with a beautiful long finish. Tasting: it ideally accompany red meats and white, grilled or in sauce, and cheese. 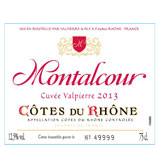 Montalcour is from the South of the Rhone Valley. It is a blend = successful marriage between varieties typical of the Rhone Valley: Black Grenache and Syrah. 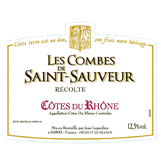 Cotes du Rhone Roses are made with the typical grape varietals of the appellation (Grenache and Syrah). A fine, elegant, powerful wine, Montalcour Rose boasts a brilliant deep pink color with lovely tints. 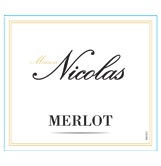 On the palate it offers freshness and reveals notes of red berries. 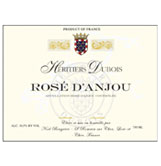 Montalcour Rose will go perfectly with cold meat dishes and barbecues, and it also ideal as an aperitif. The nose releases peppery notes, with a hint of cloves and black currant. On the palate, the wine is smooth, with soft tannins and a nice hint of acidity. 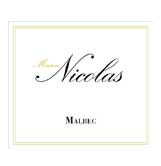 Nicolas Malbec is a magnificent deep red color wine with just a hint of violet. The nose is intense and deliciously fruity. 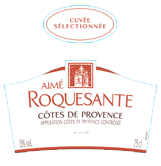 A great match for poultry, a good, juicy pork cutlet, red meats, duck and mature cheeses. The nose unfolds red and black fruits such as cherries and black currants. On the palate, the tannins are smooth, with a jammy texture. Well structured wine. 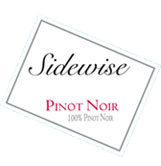 This Pinot Noir pairs well with salmon, roasted chicken, or pasta. Aromas of ripe red berries and cherry are upfront on the nose of this friendly red. Hints of sweet spice, cherry cola, and plum sauce, add depth and interest. Light bodied and easy drinking, with silky tannins. Clear and brilliant yellow color with green highlights. Bright and clean, with lemony aromas. 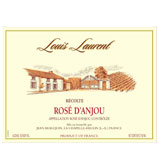 Slightly mineral on the palate, the wine shows flavors of apple with a hint of grapefruit. Lingering citrus aromas, with crisp acidity on the finish. Vinho Verde, most popular white wine in Portugal, meaning green wine. This Vinho Verde is a light white with a touch of spritz. Vinho Verde is made with the Alvarinho grape. The grape is light, crisp, and acidic. 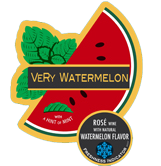 Aromas of raspberry and strawberry on the nose are well balanced with crisp citrus flavors. Vinho verde means lit. green wine, but refers to young wine. 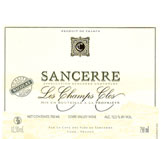 An elegant and refreshing wine with a lightly peache aroma. This wine pairs well with chocolate mousse and strawberries. Straw color. Refreshing nose with aromas of roasted grapes and apricots with a hint of honey. Deep ruby color with purple highlights. Red fruit flavor and fragrances of ripe black fruit. Complex, spicy, and intense, with a mild touch of vanilla. Forthcoming and earthy. Long, vinous finish with intense and silky tannins. Pays d'Oc 1/3 in the highest region of the valley de ; Aude 2/3 North of Beziers. 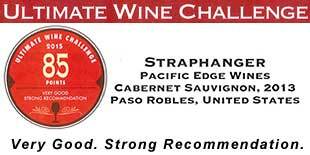 Straphanger Cabernet Sauvignon features a red brick color, with black fruit and blackberry aromas. Toasted notes with a hint of herbs. Nice finish with smooth and dry tannins. This delicious Cabernet Sauvignon pairs well with burgers, mushroom pizza, and marinated ribeye steak. Straphanger Chardonnay features a light straw color, with a simple, unassuming bouquet of citrus and vanilla. Light and clean, with a nice finish. This delicious Chardonnay pairs well with chicken, turkey, and soft cheese. Also, this California Chardonnay pairs well with yellow squash, peas, and white mushrooms. 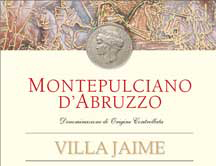 Montepulciano d'Abruzzo is a red Italian wine made from the Montepulciano varietal in the Abruzzo region of east-central Italy. Next to Sangiovese, Montepulciano is the second most widely planted red grape in Italy. This Montepulciano is an Italian red wine with intense ruby color with a strong aromatic bouquet of hints of red fruit, light to medium-bodied, with flavors of blackberry, and black pepper aroma. This Tavernello Montepulciano d'Abruzzo pairs well with tomato-based chili, spicier dishes, and meat-based ragu. As Italy's No.1 wine*, Tavernello has been enjoyed by Italian families for over 30 years and is very much a part of everyday life. This wine is clean and zesty, a nice cocktail sipper, with flavors of green apples and pears. The honeyed finish is brightened with crisp acidity, the perfect complement to food and outstanding by the glass. 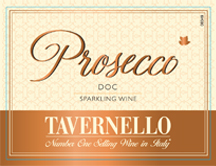 This sparkling Prosecco is the perfect way to make any occasion feel special. With its fragrant aromas and lovely fine bubbles, this is a genuine crowd-pleaser. Serve well chilled, it can be enjoyed as an aperitif - but also throughout the whole meal. It matches particularly well with fish and light courses. This intense and complex Prosecco DOC Extra Dry from the Grave zone of the northernmost region of Italy, Friuli, has fine, fruity and fragrant aromas on the nose and a round, pleasant and fresh texture. 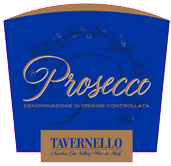 Tavernello enjoys a rich heritage; combining generations of Italian tradition with modern, innovative winemaking techniques to deliver a range of good quality wines that provide excellent value for money. This red wine pairs well with classic Italian dishes including lasagna, aubergine parmigiana, spaghetti and meatballs. 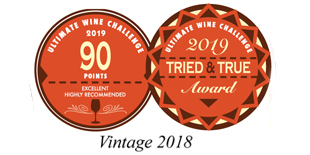 Caviro is the leading Italian wine co-operative with 34 partner wineries and over 13,000 wine growers throughout the leading wine regions of the country. 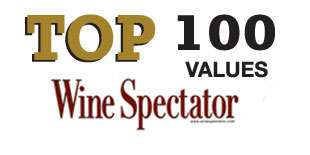 Tavernello is the #1 wine Italy. With an intense ruby hue and delicate violet aromas, this classic Italian sangiovese is dry, well balanced and simply bursting with blackcurrant flavours that are balanced with soft tannins. 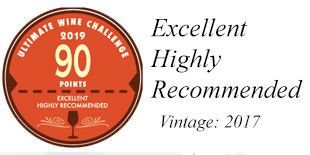 This red wine pairs well with rich tomato-based pasta dishes including tagliatelle alla bolognese, and is an excellent accompaniment to roast beef and fullflavoured stews. Soave is a dry white wine made mainly from the Garganega grape.It is a dry white wine made mainly from the Garganega grape. 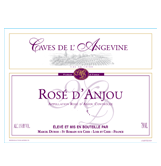 It has good acidity and shows aromas and flavors of apples and almonds. Soave is refreshingly crisp and suitable for light pasta dishes, white fish, and radicchio. This white wine can be enjoyed simply on its own by the glass or as an accompaniment to pizza, fetuccine Aldredo and salads. Deep cherry color with a violet rim showing its youth. Good aromatic intensity of very ripe red-berry fruits, with hints of fine pastries well integrated with the nuances of the French barrels. Delicate pale pink color. Rosata Sangiovese is vibrant on the palate with fresh fruit aromas of pear and citrus. 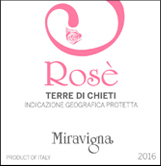 Best served chilled, this rose is the perfect match for fish dishes, light salads and risottos. The deep red color speaks volumes about the quality of this wine. A Powerful dense nose with aromas of black fruit, liquor cherries and fresh, high quality wood. This is carried through to the palate with an additional touch of smoothness. The fine elegant tannic structure supports superbly intense flavors of Havana cigars and chocolate. The finish has remarkable length. 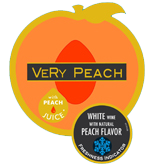 VeRy PEACH is the expression of the perfect balance between white wine & peach. 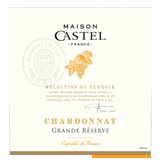 The finesse of the peach aroma and slightly sweetness of the fruit, enhance the refreshing white wine. A bright yellow color with golden highlights. Fresh and pleasant on the nose with persistent aromas of peach. The palate is fresh and supple and express the perfect balance between the vivacity and the sweetness of the peach. 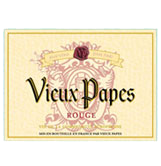 Vieux Papes Red is a wine made with a selection of the greatest French wine varietals blended with the greatest care. The color is intense and deep, and the wine has aromas of ripened fruit. This is a supple wine, round in the mouth, easy to drink and good with all dishes. 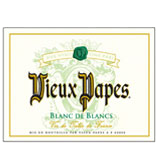 A selection of the best white wine varietals in France gives Vieux Papes White its fruity, crisp qualities. It has a delicate yellow color with brilliant green highlights. Full, well-balanced, and clean, it is just the thing with shellfish and white meat. Intense ruby red color with violet reflections. Fruity nose with hints of violets and black cherry. The taste is harmoonious and lasting, with firm body and soft tannins. 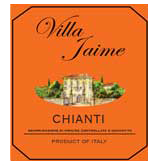 The earliest Chianti dates back to the 13th century in Italy. Today, Chianti is the most popular and well know Italian wine. This delicious red wine made from the Montepulciano grape is inky blackish purple in color, with a rich aroma of black plums. Nicely balanced, with food friendly, soft tannins and a smooth finish. This montepulciano can be paired with spicy dices or with pasta. Montepulciano is native to the region of Abruzzo in east-central Italy. Golden yellow color with green highlights, light and lively, with bright citrus flavors and a hint of spice. Crisp acidity on the finish. Pinot Grigio pairs with light fish dishes. Light seafood dishes seem to take on more flavor when matched with equally delicate white wines. The most popular white wine in Italy. 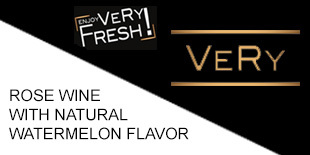 flavors can range from ripe tropical fruit notes of melon and mango. 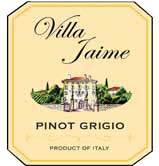 In Italy, Pinot grigio grapes are often harvested early to retain the refreshing acidity and minimize some of the overt-fruitiness of the variety.